Previously, Spot Cool Stuff reviewed the best websites for printing business cards. For that post, we assumed people were looking to print business cards that were cool-looking, distinctive but also relatively inexpensive. But what if cost were not so much a factor? Then there’s another business card strategy you could follow: To encouraging potential business contacts to hold onto your card have it double as a useful item. Below are seven examples of such useful business cards, each pulled off to a varying degree of success. 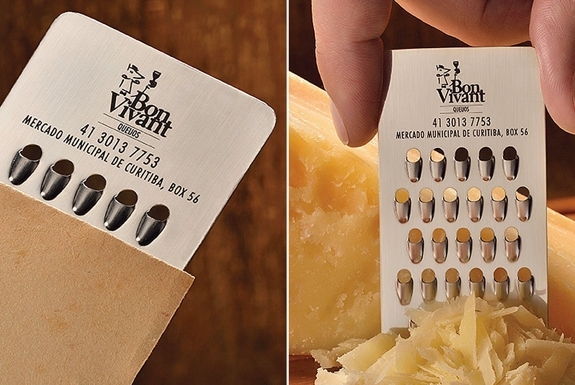 What could be greater than a business card that’s, literally, also a cheese grater. The design, which was the work of the cool marketing communications company JWT, has certainly put the Bon Vivant cheese shop in Curitiba, Brazil on the map — even for people who couldn’t locate Curitiba, Brazil on a map. The shop’s cheese grater business cards have been written up by press from as far away as Japan and New Zealand. Locally, Bon Vivant went through their first run of 1,000 cards in four days, forcing the shop to institute a one-card-per-customer-per-week rule! See it in action here . . .
1010 Tires sells new tires online. But their employee’s business cards don’t only tell you where you should buy your new tires, it tell you when. 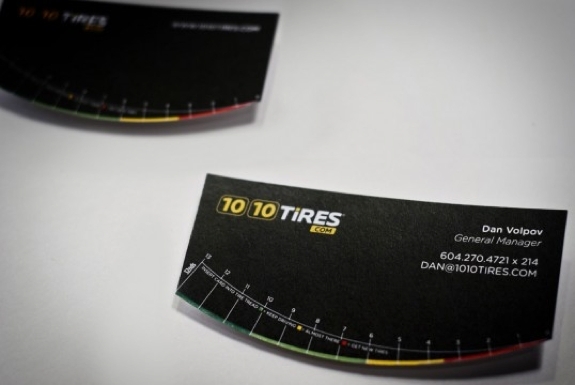 That’s because each card, which was designed by Spring Advertising, can be used by customers to check how much tread they have left on their tires. 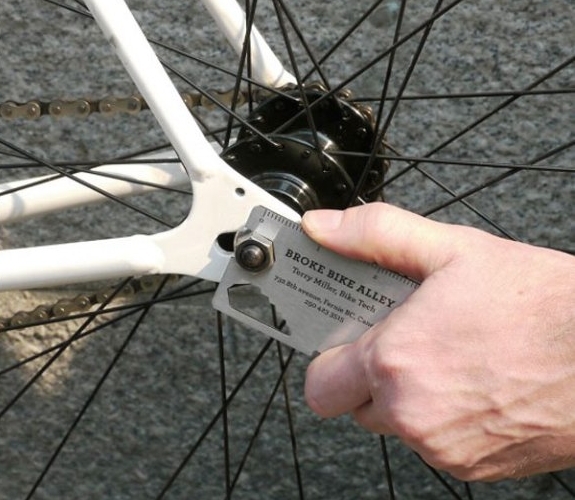 While still fitting in your wallet, this business card can be used to adjust bicycle spokes, loosen and lighten bolts and, oh yeah, also open a beer! 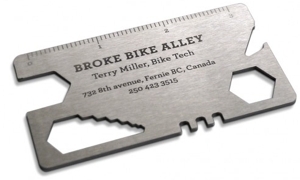 The bicycle store that hands out these cards — Broke Bike Alley in Fernie, British Columbia — has a history of coming up with useful business card ideas. Their last card doubled as a bicycle tire patch! Both cards were designed by Rethink, Canada. If you are a security company you might have an interest in making people feel unsafe in their homes. But is it a step too far to hand out the means for people to break in? That’s what one Nevada firm did with their business card that’s also a functional lock pick! We had to wonder whether this was legal but it turns out wallet-size lock pick sets are readily available for sale. So, yeah, we’d won’t be sleeping quite so well at home tonight. 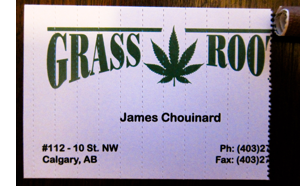 There are at least six head shops we know of with business cards that have perforated lines that divide the card into strips. Of course, no one who reads this blog would have any experience with why that is — the strips are meant to be rolled up and used as joint filters. There’s something ingenious about a business card that helps people stay addicted to your business’s product. 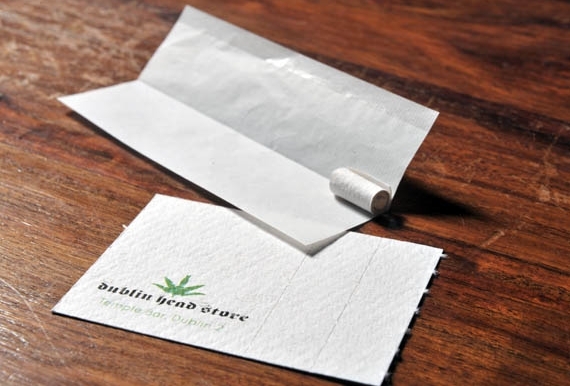 But head shop owners take note: If you give out joint filter business cards, put your contact info on a portion of the card that is NOT designed to go up in smoke (like the Dublin Head Store, below). Encouraging your customers to tear up your entire card (a la Grass Roots, right) then that’s a rather, um, half-baked idea. Mondo do Condominio sells cleaning products. And their employees’ business cards are a cleaning product. 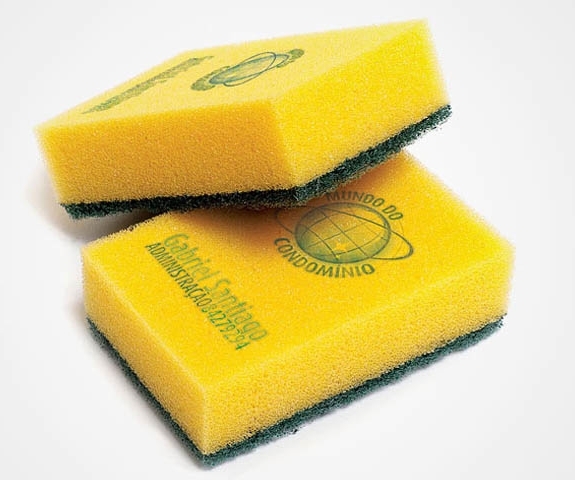 The card becomes a useable, full-size sponge after it gets wet but isn’t much thicker than a regular business card when first handed out. Whether the contact information stays on the sponge-card after it’s used to scour a few dishes — that’s a different matter. You’d think that making edible business cards would be a bad idea. (And you’d be right.) But there’s a difference between making a card that’s “delicious” and one that’s merely “edible.” This might be what the founders of Meat Cards — a company that seems like it’s been in the startup phase for the last three years — were thinking. 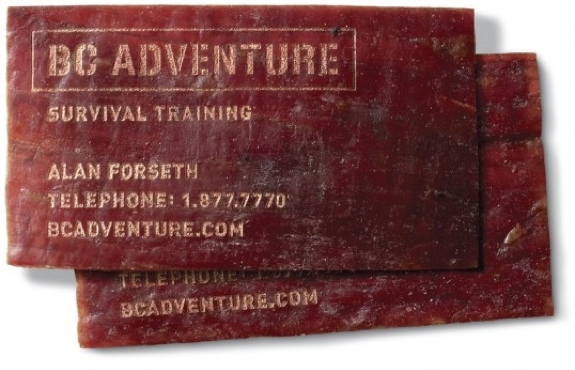 Their cards are made from beef jerky that remains edible for up to one year. The contact info is then etched into the dried meat using a laser. Among their clients are survival training schools (see below) and cattle auctioneers.